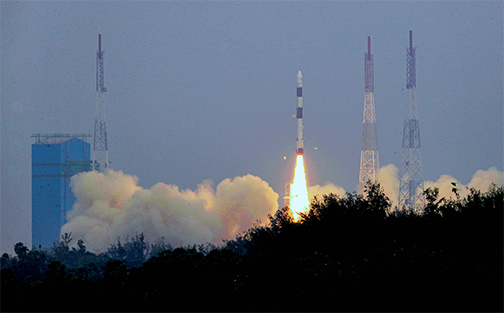 Kepler Communications successfully launched their second, wideband satellite to LEO on the Indian Space Research Organization (ISRO) Indian Polar Satellite Launch Vehicle (PSLV) C43 mission that lifted off from the Satish Dhawan Space Centre in Sriharikota, India. smallsat aboard. Photo is courtesy of ISRO. The lessons learned from almost a year of operating the first satellite were incorporated into the development of the second to improve the reliability. Kepler has already demonstrated a capability to deliver upwards of 40 Mbps to 60 cm. diameter VSAT and more than 300 Mbps to Kepler’s 3.4m gateway in Inuvik, Canada. 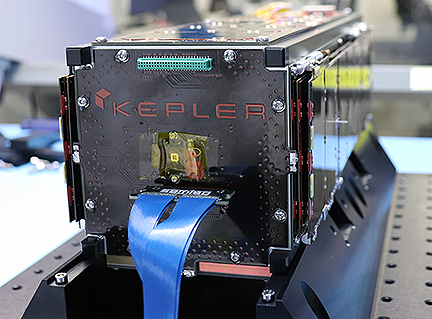 Kepler also became the first company to use a wideband LEO satellite to acquire, track, and communicate with an electronically-steered antenna when Kepler and Phasor performed their collaborative demonstration. Photo of the CASE smallsat. Photo is courtesy of Kepler Communications. CASE was built in collaboration with ÅAC Clyde and Bright Ascension Ltd. The satellite payload is Kepler's proprietary software defined radio and antenna that uses Enclustra and AHA (of Comtech EF) components. The Kepler ground support network was built in collaboration with Comtech EF Data, Kongsberg Satellite Services, and Innovative Solutions in Space. The satellite was launched by Antrix Corporation Ltd., a wholly owned Government of India company, with the support of ISED, Canada for licensing. Mina Mitry, CEO of Kepler, said this is an exciting month for Kepler. Following the company's recent FCC approval, the successful launch of the firm's next satellite marks an important milestone for the team to deliver Kepler's network on schedule. This is but the start of an upcoming and regular launch cadence. The company continues to increase network capacity and deliver a more persistent, reliable, service to our customers every step a long the way.